Having been trained by Bryan, I’ve gained an understanding and appreciation for craft beer, and slowly getting into drinking the hoppier, more bitter kinds. I still remember a couple of years ago, I made a comment to my CEO that a beer I was drinking was “too hoppy for me.” I couldn’t live that one down for a very long time. 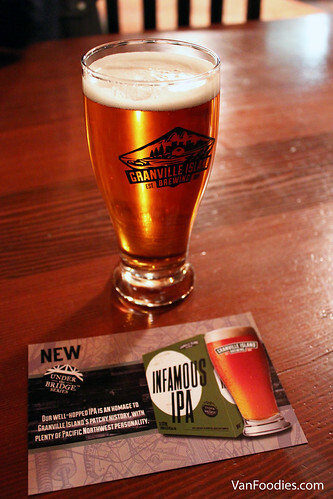 So Granville Island recently launched its new Infamous IPA as part of the Under the Bridge series. While Bryan was having a well-deserved vacation, Mr. and I checked out the launch event called “A Night of Infamy” at GIB’s Tasting Room. To my surprise, it was not only fun but also educational! Unlike most other events we have been to, you actually had to work for your booze. 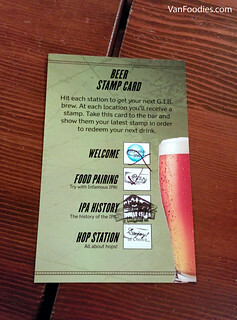 We had to visit the 4 stations set up throughout the tasting room, and collect stamps in order to redeem our beer. when troops and British citizens living in India did not have access to good British ale and any attempts in overseas shipment had resulted in spoilage after the months-long journey on the open sea. 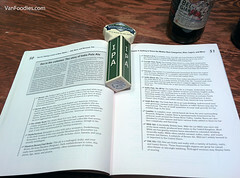 Enter the IPA of which its higher alcohol content and high amount of hops used has eliminated the problem. That being said, did you know that the original IPA was way less bitter and less hoppy than what we are drinking these days? 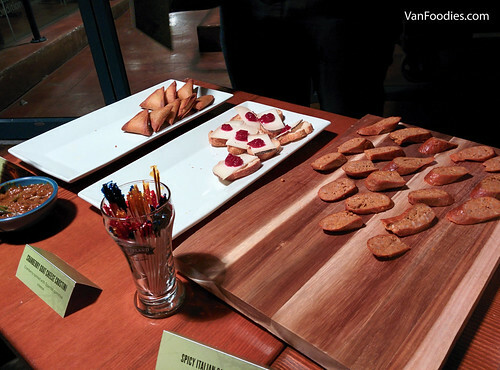 We also got to try a few food and beer pairings with the Infamous IPA. You probably figure that it should be paired with something with bold, rich flavours. While the Infamous IPA is best paired with spicy food like curry or fried dishes, the hops accentuates the spice/heat level, so it actually makes spicy food even hotter, . And meet Nick, GIB’s new Brewmaster who has only been in this role for 1.5 weeks when the event was held. He has taken over after the 13-year GIB Brewmaster Vern Lambourne left the role a few weeks ago. 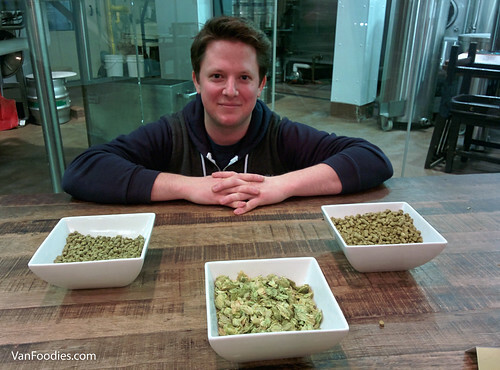 Coming from the sister brewery Creemore Springs Brewery, Nick gave us a quick lesson on hops. The Infamous IPA uses a combination of cascade and citra hops. I’m most familiar with the cascade hops, which are known for its strong grapefruit, citrus peel aroma and taste. 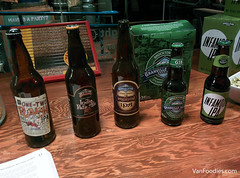 According to Nick, all the hops were added in the beginning of the boil, which imparted more of the bitter taste and less of the floral aroma commonly found in IPAs. So, how was the Infamous IPA? 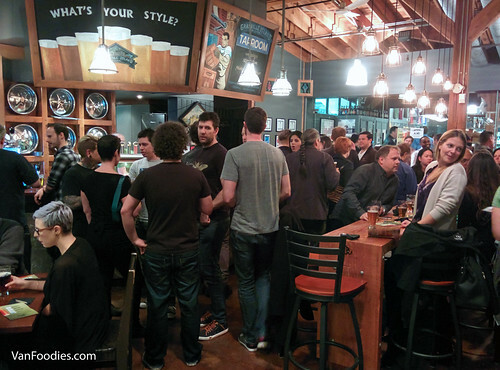 With the exponential growth in the craft beer sector in Vancouver, I totally feel for medium-to-large sized breweries such as GIB that are trying to win back the hearts of craft beer lovers. Like Nick said, it doesn’t have the strong grapefruit taste that I often associate IPA with. It’s not very heavy, and the bitterness is prominent with an IBU of 55. In my opinion, it’s quite an easy drinking IPA and would be a good option for those who are just getting into IPAs. I would have it again.